I never had an opportunity to meet or see Pope Benedict XVI but I have a memento to remind me of him. A priest that said Mass at an Indy Car race I attended had just returned from Rome and had a number of rosaries with him that were blessed by Pope Benedict. He gave them to those of us who wanted one and this is it. 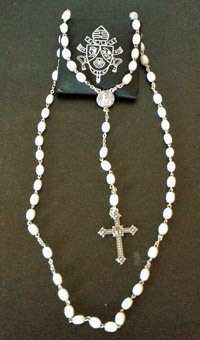 I prayed my rosary with it this morning! If you’d like to offer some prayers for our outgoing Pope here are some petitions from a document titled, “LITURGICAL NOTES AND RESOURCE MATERIALS FOR USE UPON THE RESIGNATION OF THE POPE” (pdf) available from the Secretariat of Divine Worship of the U.S. Conference of Catholic Bishops. That Pope Benedict XVI may be given the strength needed to complete faithfully and fully his remaining ministry as our Pope, we pray to the Lord. That Pope Benedict XVI, who has served the Church faithfully as Supreme Pontiff, may find peace and consolation as he turns to a life of prayer for the Church, we pray to the Lord. That the tireless efforts of Pope Benedict XVI in fostering the unity and communion of the Church may bear fruit in our hearts and among all Christians, we pray to the Lord. For Pope Benedict XVI, who preached that God is love and that we are saved in hope, that he may strengthened in hope and know God’s love for him now and for all eternity, we pray to the Lord. Our Holy Father has made headlines with one tweet. And one that’s not even on his own personal Twitter account. He doesn’t have one. He did it on an iPad using the Vatican’s Twitter account. His post says, “Dear Friends, I just launched News.va Praised be our Lord Jesus Christ! With my prayers and blessings, Benedictus XVI.” If you haven’t checked out the new Vatican website you need to. It is much improved. It is great seeing our Holy Father embrace digital media and the internet as mechanisms to witness to our faith and evangelize the message of Jesus Christ. According to a note in my latest Vatican Information Service update, Pope Benedict spoke to a conference on, “Digital Witnesses. Faces and languages in the multi-media age”. The congress was organized by the Italian Episcopal Conference, the president of which is Cardinal Angelo Bagnasco, archbishop of Genoa. Here’s what he said. “The time in which we are living is seeing an enormous expansion of the frontiers of communication”, said the Pope. “The Internet is by nature open, tendentiously egalitarian and pluralist, but at the same time it also represents a new gulf. Indeed, we talk of the ‘digital divide’, which separates the included from the excluded, and this must be added to other separations which already divide nations, both from one another and within themselves”. Benedict XVI also noted “the dangers of conformity and control, of intellectual and moral relativism, which are already evident in the diminution of the spirit of criticism, in the truth reduced to an interplay of opinions, in the many forms of degradation and humiliation of individual intimacy. We are witnessing a ‘pollution of the spirit which clouds our faces and makes them less prone to smile’. There are quite a few places you can find coverage of the Pope Benedict’s visit to the Holy Land. I did not know that he’ll on be the 3rd Pope to make this pilgrimage. Peter was first, then Pope John Paul II and now our current Pope. I must have been reading Pope Benedict’s mind when I wrote the post, Be Imitators of Christ, on Tuesday. His June prayer intention: “That all Christians may cultivate a deep and personal friendship with Christ, in order to be able to communicate the strength of His love to every person they meet.” (h/t: American Papist).